Tyler Arnason, the son of former NHL player Chuck Arnason, has played in 487 games with Chicago, Ottawa and Colorado and has been a regular in the league for six seasons. New York Rangers President and General Manager Glen Sather announced today that the club has agreed to terms on a two-way contract with free agent forward Tyler Arnason. Arnason, 30, skated in 71 games with the Colorado Avalanche last season, registering five goals and 17 assists for 22 points, along with 14 penalty minutes. He finished seventh on the team in scoring with 22 points, and tied for seventh on the Avalanche with 17 assists. He also ranked third on the club with 58 takeaways. Arnason recorded four multi-point games on the season, including a three-assist performance, which tied a career-high, on March 8 at Chicago. He posted a season-high, four-game point streak from January 10 against Pittsburgh to January 16 vs. Edmonton, collecting four points (one goal and three assists) over the span. In 2007-08, Arnason finished second on the Avalanche with 179 shots, registering 10 goals and 21 assists for 31 points in 70 games. He ranked eighth on the team in assists and ninth in goals and points. He also led Colorado with nine points (three goals and six assists) during the month of February. Arnason posted eight multi-point performances, including two, three-point games – January 30 against Chicago (one goal and two assists) and February 9 at Vancouver (one goal and two assists). He also registered 16 points in a 13-game stretch from January 12 at Carolina to February 9 at Vancouver (four goals and 12 assists). On February 24, Arnason notched the fastest goal to begin a game by an Avalanche player during the season, tallying a goal 27 seconds into the game at Edmonton. He recorded his 200th NHL point with an assist on November 16 at Dallas, and skated in his 400th career game on March 1 against Los Angeles. In addition, Arnason registered five points (two goals and three assists) in 10 playoff contests with Colorado. He tied for third on the team in postseason goals (two) and fourth in assists (three) and points (five). The 5-11, 204-pounder has skated in 487 career regular season contests with the Chicago Blackhawks, Ottawa Senators and Colorado Avalanche, registering 88 goals and 157 assists for 245 points, along with 140 penalty minutes. He established career-highs in goals (22), assists (33), points (55), power play goals (six), and shots (222) as a member of the Blackhawks during the 2003-04 season. 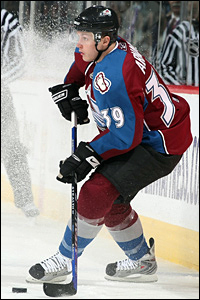 In his first year with the Avalanche in 2006-07, Arnason tied his career-high for assists (33), and finished third on the club with 211 shots. In 2005-06, he posted a career-high, seven-game scoring streak from December 3 at Florida to December 18 vs. Dallas, registering nine points (four goals and five assists) during the stretch. In addition, Arnason has recorded two career hat tricks, and was selected to the 2003 NHL All-Rookie Team following his first full season with Chicago. The Oklahoma City, Oklahoma native was originally Chicago’s seventh round selection, 183rd overall, in the 1998 NHL Entry Draft.